What do consumers want from their healthcare system? As big changes and shifts occur in the healthcare industry, organizations can only stay afloat if they continue to ask this question and take action to address consumer needs in innovative ways. 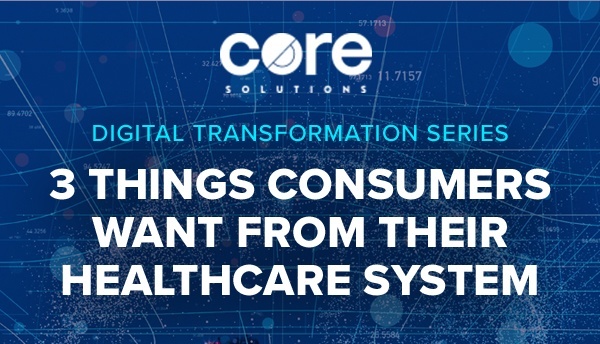 Tackling digital transformation within your healthcare organization can help improve consumer outcomes, but it shouldn’t be the only to-do on your list. In a recent report by PricewaterhouseCoopers (PwC), we saw that although many organizations are able to bring administrative tasks up to the speed of modern technology, they still fail to serve other critical needs throughout the customer experience. PwC found that consumers were happy with their health insurance coverage and the value they received in treatment but remained dissatisfied with their overall healthcare experience. The proliferation of urgent care centers is a great example of the effect consumers have on the market when they act on their desire to make choices about their care. Because it became expensive for people to head to the emergency room when they needed immediate care or council for non-life-threatening conditions, urgent care centers stepped up to meet the need for an alternative service. But these centers quickly expanded their service offerings, taking in people for everything from colds, coughs and flus to x-rays and drug testing. Urgent care facilities succeeded because they offered choice—the choice to avoid long wait times at small primary care physician offices, the choice to have needs served locally, the choice to obtain medication with convenience, and the choice to receive care at any hour of the day. When given options, consumers are willing to seek healthcare services from nontraditional sources, and doctors are left with much less power than before. Think about your own organization and how you allow choice for those you serve. Pharmacies and minute clinics like CVS and Rite Aid already employ effective engagement tactics to give consumers the interaction and attention they want from their healthcare. Often when people visit a minute clinic, they’ll opt in to receive useful information and reminders about seasonal allergy tips, vaccination needs and health test recommendations. Content marketing like this informs people about things that their primary care physician might not think to share or have time to discuss. This approach to marketing and consumer engagement reveals an important difference in business models and reinforces the idea that the most effective model today is one that centers on the consumer. Organizations that survive in a value-based healthcare system are those that have the ability to engage with consumers, sharing useful information to build a trusted relationship—not just contacting them when there is a need. 3. Consumers want an experience. Consumer engagement is a key component of the customer experience, which is essentially the sum of everything that happens between a brand and its consumers. There isn’t one explicit definition of a well-formed customer experience, but it’s something that organizations strive to create because all people place value on the way services are delivered to them. Each time customers interact with an organization, they should feel as though they’ve had a positive outcome, which adds to their overall perception of the brand. Consumers don’t just want their healthcare services delivered quickly and quietly—they want an experience that makes them feel close to the organizations and offices they frequent and the brands they grow to trust. This means business leaders in the healthcare industry, just like those in other fields, must view the delivery of their services, the environment they build for visitors and the engagement strategies they employ from the eyes of the consumer to craft a memorable experience that keeps consumers satisfied with the services and loyal to the brand. How can we serve these needs well? Building an organization around the consumer and focusing on consumer advocacy is the only way to serve these three needs well, but these efforts take time to perfect. With work, the healthcare industry will reach a point where consumer advocacy is not just a concentrated aim, but rather a crucial component of a successful healthcare business model. And because it’s here to stay, value-based payment (VBP) should also guide all business objectives because it ties today’s healthcare organizations to outcome measures. The direction of the industry has shifted from volume to value, forcing more organizations to focus on improving outcomes by considering their business a channel for boosting quality of life. Interested in learning about the role of EHRs in improving consumer outcomes? Request a demo of our EHR solution below to get to know our platform, our organization and our team.